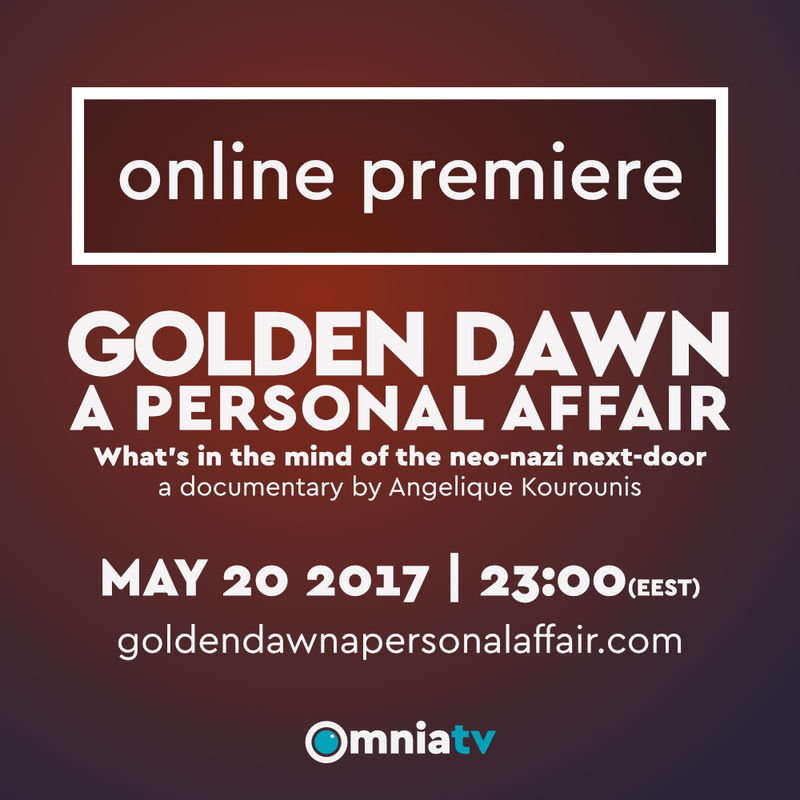 After a year of screenings in Greece and many other countries in the world, Angélique Kourounis’ documentary film “Golden Dawn: A Personal Affair – What’s in the mind of the neo-nazi next-door?” will be available online on Saturday, May 20 2017, at 23:00 EEST (20:00 GMT – 21:00 BST – 16:00 DST), during the mini-festival omniatv: six years of grassroots reporting that will take place in “Chytirio” theatre in Athens. 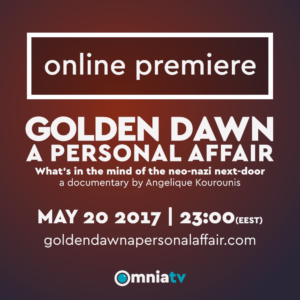 The film will be available in Greek, English and French, on its website goldendawnapersonalaffair.com under a Creative Commons – Attribution – Non Commercial – Share Alike 4.0. Subtitles will be available for Spanish, Catalan and Italian, with the German version also following soon. 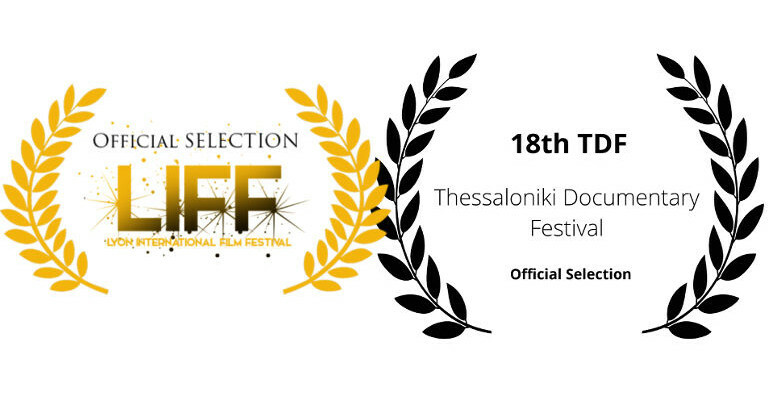 The documentary was first presented in the 18th Thessaloniki Documentary Festival, it has been selected in the programme of 12 more festivals in Europe as well as in Canada and the USA, and was screened in more than 170 local events organized by citizens’ groups, associations, communities and institutions. It was presented with the Prix MPM Averroès Junior at the 20th PriMed Festival in Marseille, and an Honorable Mention for Best Documentary in the 19th Los Angeles Greek Film Festival. omniatv is an online platform aiming to inform on social and political issues by written articles, online broadcasts and producing or co-producing documentary films, since 2011. These films will be screened during the two days of the mini-festival, followed by a discussion panel on each documentary’s subject. What’s in the mind of the neo-Nazi next-door? The screening will be followed by discussion with the director and members of the production team in the cinema’s bar. The financial collapse, the political instability and the family relations are placed into the spotlight as the documentary is trying to discover “what’s in the head of GoldenDawners, who pose as victims” of the system. 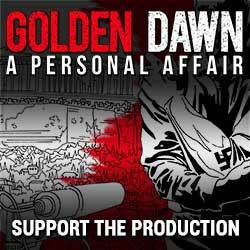 Golden Dawn “never hid” its ideology. Its influence in the polls might have been almost nonexistent previously, but the compatibility of this ideology with unshakeable beliefs in Greece – cultivated by many clergymen and most of the Media and political system – is the fertile ground on which the organization flourishes. The director is looking into the matter through her personal obsessions, her concerns and fears, after dedicating many years and another two television documentaries in approaching the neo-Nazi party, which has taken the third position in Greece’s political system after three decades of obscure but bloody activity. Free entrance – for your convenience please reserve your seat in advance. How can a racist party that was getting less than 0.2% of the vote for years, enter parliament with 18 MPs? How can a party that promotes violence, hate, sexism and murders amplify its reach after each pogrom? How can Golden Dawn, when in France it could never exist – in the same way -, remain the third political power in Greece for four years?